We are in full summer mode here in Houston and there are some delicious vegetables to be had at local markets. 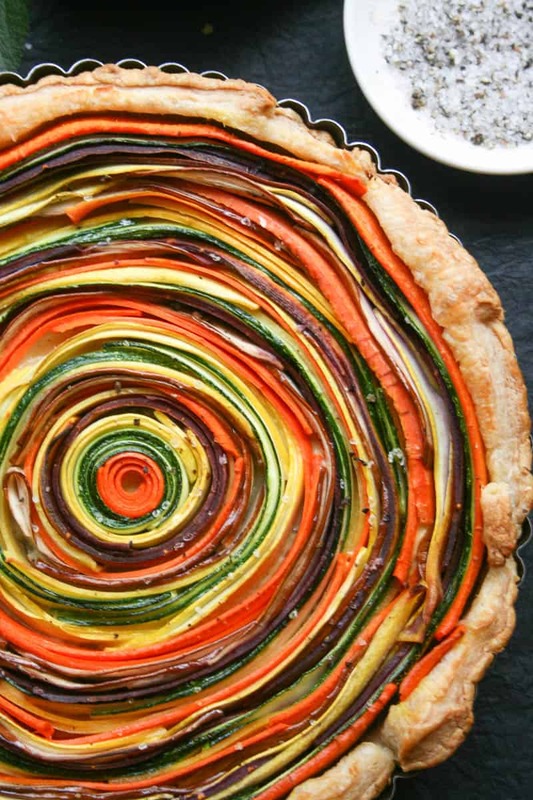 I like to buy squash, zucchini, eggplant, tomatoes, corn, and peppers by the buckets during this time of year and what better way to use up those veggies than with this summer vegetable tart. 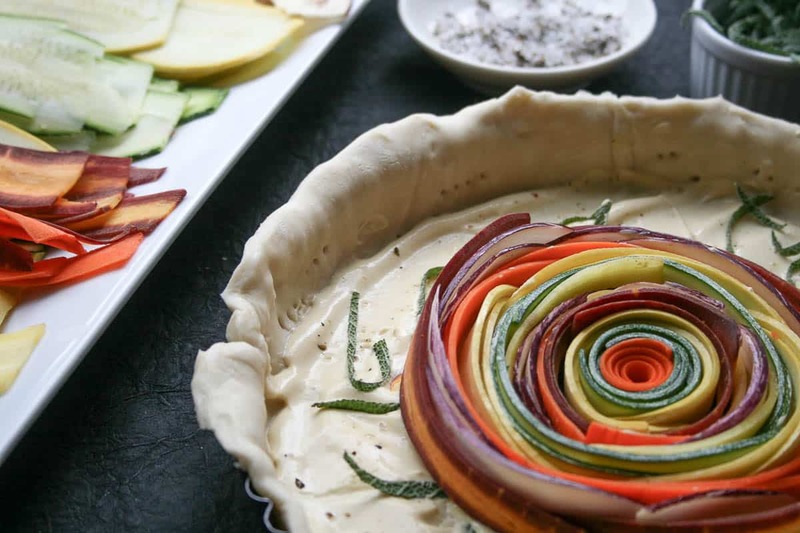 When I decided to make this summer vegetable tart, I went back and forth if I had the patience to wrap slivers of vegetables around each other or was I just going to get frustrated with the dough before I even made it that far. Good news, no frustration just a easy but elegant summer dish! To achieve these ribbons of vegetables, I used my mandolin, but you can also use a vegetable peeler or slicer. I used puff pastry dough to achieve the golden flaky crust around the tart. I formed the dough into a tart pan and poked with a fork before spreading a mixture of crème fraîche, dijon mustard, lemon zest and garlic paste. 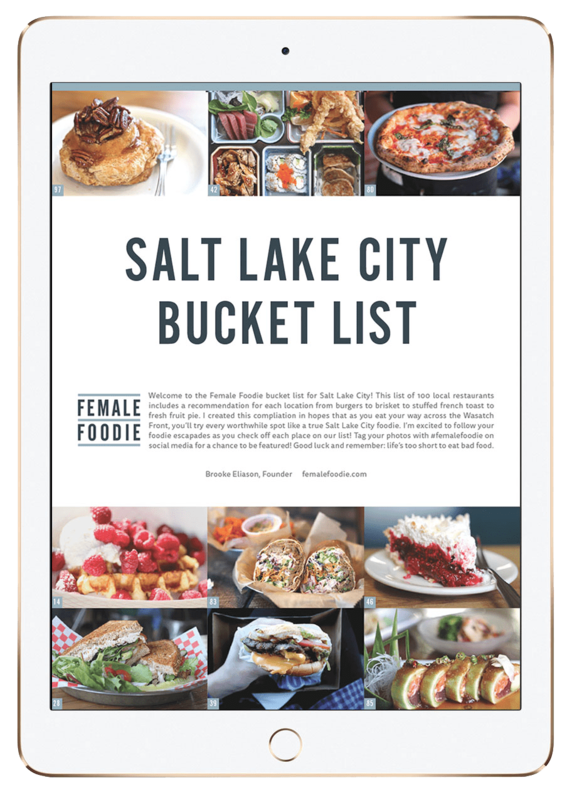 Topped with fresh sage and a generous amount of salt and fresh cracked pepper. 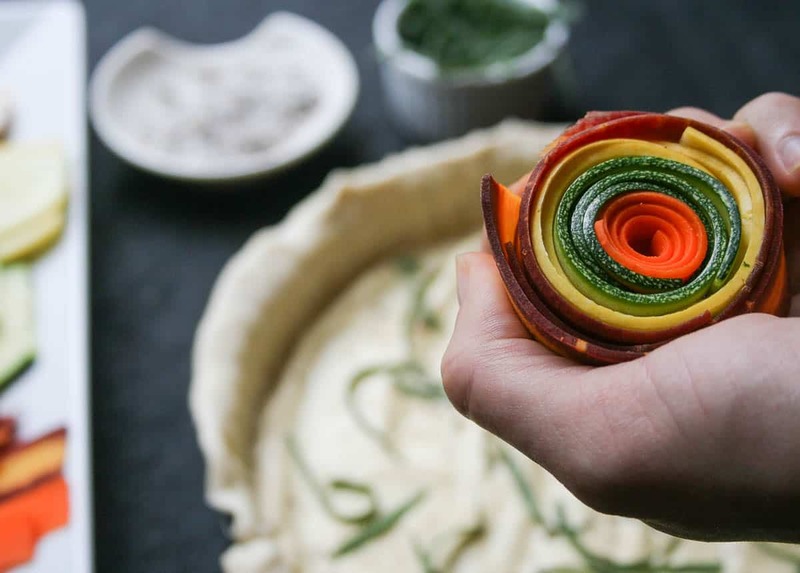 To start the spiral process, form the first few layers in your hand until they are sturdy when placed on the dough. 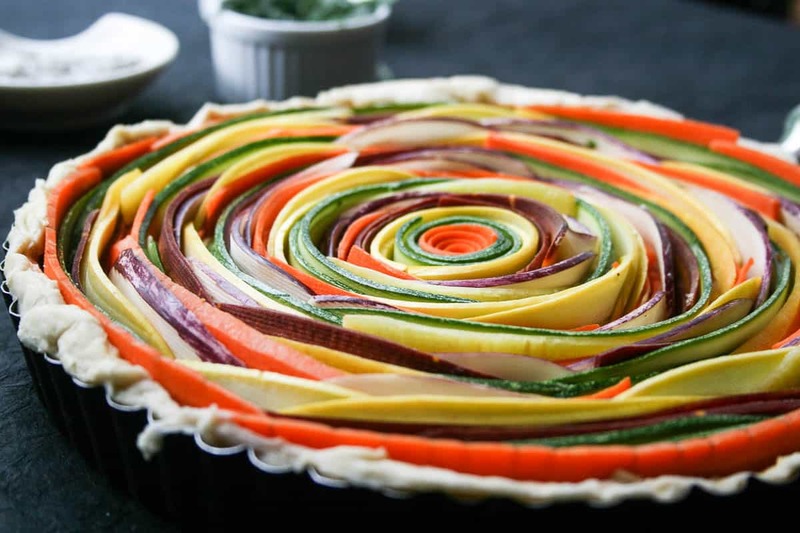 Once you formed the center, work your way outward with layers of vegetables. You can be creative with the color pattern based on the vegetables. 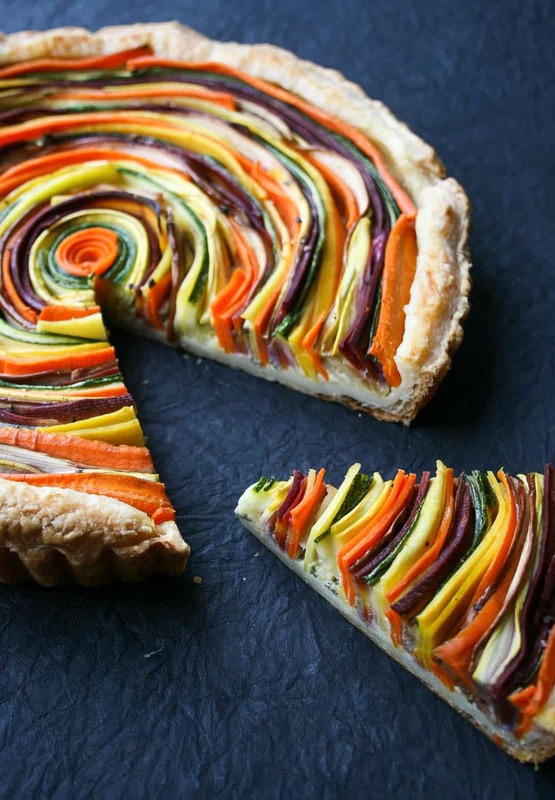 This summer vegetable tart has carrots, zucchini, yellow squash, and eggplant. You can make substitutions with tomatoes, peppers, sweet potatoes and onion. I found the carrots helped keep the spiral tight. I also used tri-colored carrots to have more depth of colors. Once you have finished the spiral of beautiful vegetables, drizzle with olive oil, a dash of salt and fresh cracked pepper. The hard work is done and the final product is a beautiful creation of local summer vegetables. Enjoy! 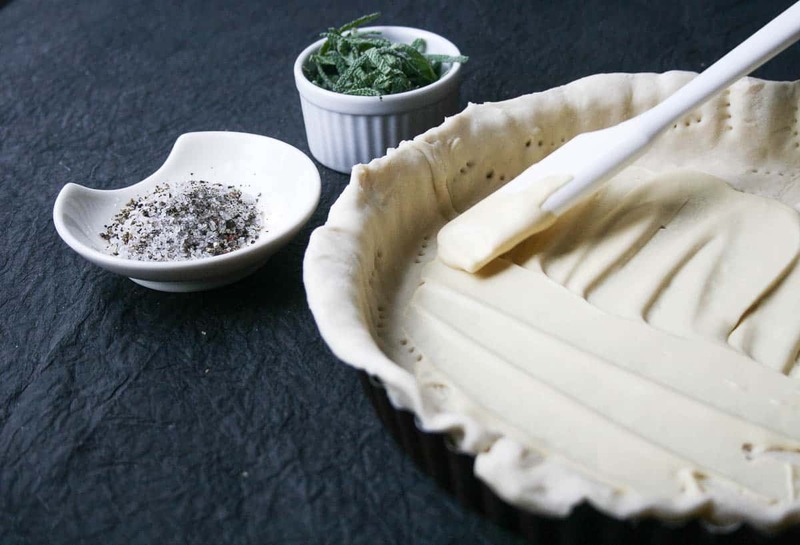 Preheat oven to 375 F. Place the pastry dough in a tart pan and prick several times with a fork. Set aside. 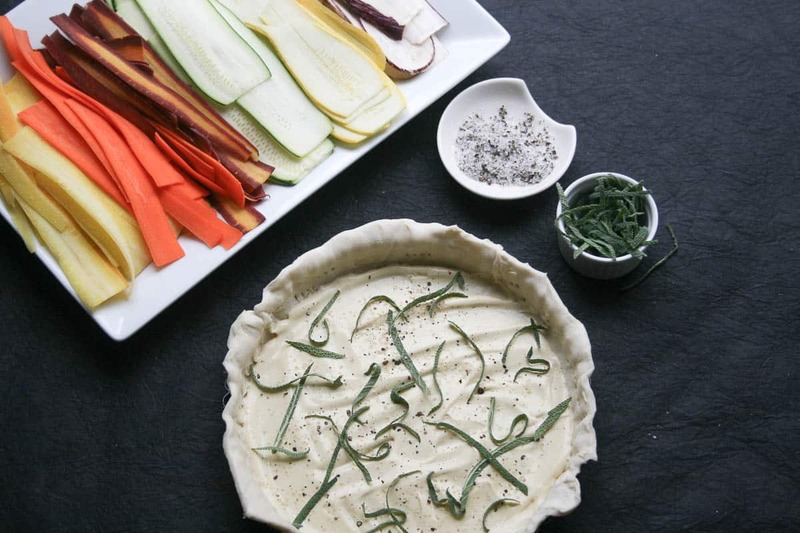 Mix the crème fraîche, dijon mustard, lemon zest and garlic paste together and spread on top of pastry dough. Sprinkle with sage, salt and pepper. 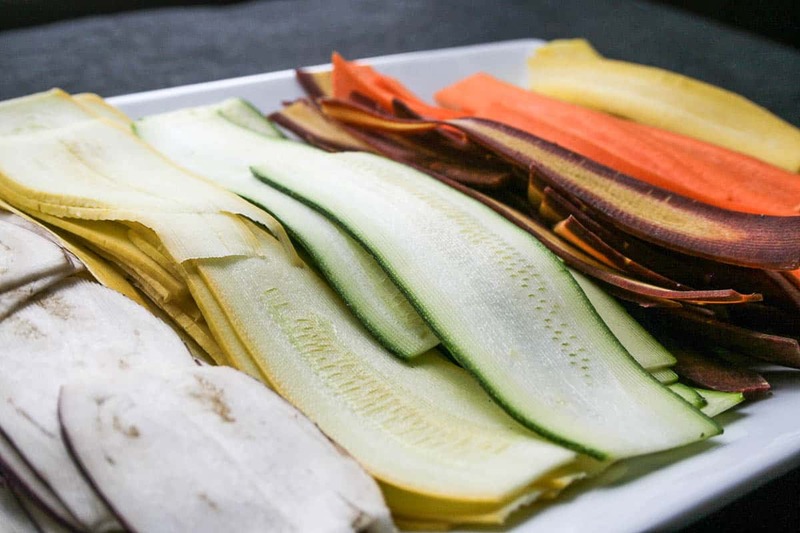 Wash the carrots, eggplant, squash and zucchini and use mandolin to slice into thin strips. Make sure to cut with skin attached for the colorful spiral effect. Start by rolling carrot into spiral and following with zucchini, yellow carrot, squash, purple carrot, eggplant and repeat to complete dish. Drizzle with olive oil, salt and fresh cracked pepper. Bake in oven for 40 minutes, rotating half way though. 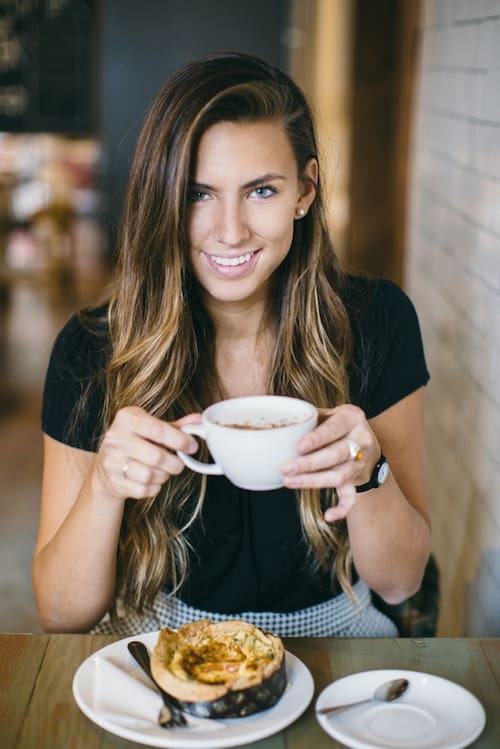 This looks so delicious, not to mention gorgeous!